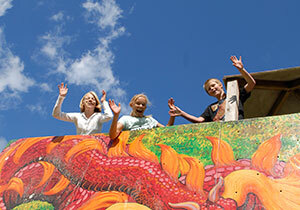 opportunity to have fun with other children..
Have you met Kalle Kanin? He is our mascot. He is everywhere when there are activities in the Activity Club, with the animals in the fields and in Restaurant Sofie. 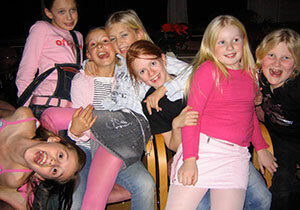 Every evening during the summer holidays we offer a special Kalle Kanin buffet for children. While your parenst or grandparents choose from our menu you have already started eating in order to spend more time at our playgrounds after eating. 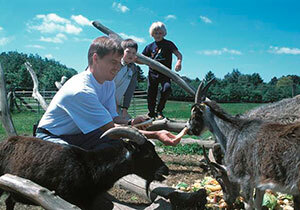 During the summer you can visit the animals where they grass and even touch them if you are lucky. The rest of the year they walk peacefully in the fields and you still have opportunity to look at them and feed them from a distance..
Read our programme for the Activity Club and check what is going on this summer. 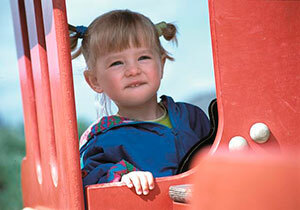 This is our catalogue with inspiration for things you can do with your family all on your own. Challenge your family. Have fun and be active in beautiful surroundings. 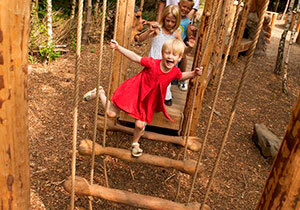 Visit the nature playground and use your imagination..